I’ve recently been writing a new piece for wind band, commissioned by the London Youth Wind Band, conductor Geoff Harniess. They performed my ‘Procession’ last year so I was pleased that they wanted more! I’ve not written for wind band for many years, and it first sight it is a daunting prospect – there are more staves in the score than the average orchestral piece, and inevitably the lack of a string section, and focus on wood wind and brass, requires a quite different approach to sonority, melodic lines, and balance than writing for an orchestra would require. The LYWB are an enthusiastic and skilful bunch of players, but the expectation for wind band writing is always that certain instruments are taken by the more experienced players and that some instruments are optional and thus need to be ‘covered’ in other instrumental parts: and the difficulty is to avoid the music becoming too bland colourless and unvaried in the doubling process. I hope I’ve succeeded – we’ll wait until the performance to find out! 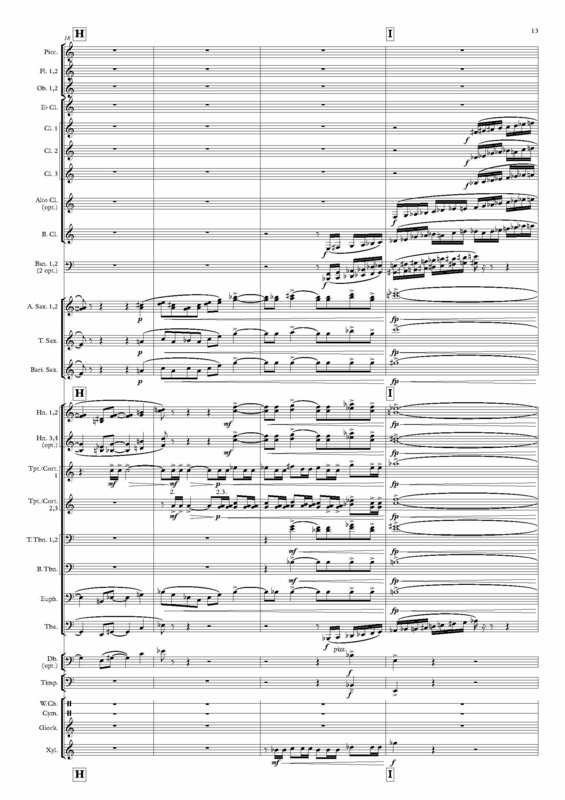 Here’s an excerpt from the second movement – ‘The Shard’. Much contemporary wind band music is inspired by a non-musical subject or title, and aspects of film music often figure quite heavily too. Rather than writing a continuous 8 minute piece, as I did in ‘Procession’, I decided to write a suite of three short pictorial movements, London Landscapes, which I hope would have an instant appeal. Given the circumstances of the commission, it seemed good to celebrate London, the city that I grew up in (my secondary school, no longer there, overlooked Tower Bridge and was next to what is now City Hall) but rather than dwelling on the past, to focus on aspects of the present. Thus the three movements focus on recent times: the first one is a portrait of the Millennium Bridge, with a steady procession of pedestrian sightseers (and the occasional wobble): the second describes the Shard, the 1000 ft. tower which is firmly on the ground, yet pierces the sky: and the final movement takes us to the vibrant and busy Canary Wharf financial district, though with a reminder of the watery docks on which it is built. I’ve really enjoyed writing the piece and creating these three ‘picture postcards’. 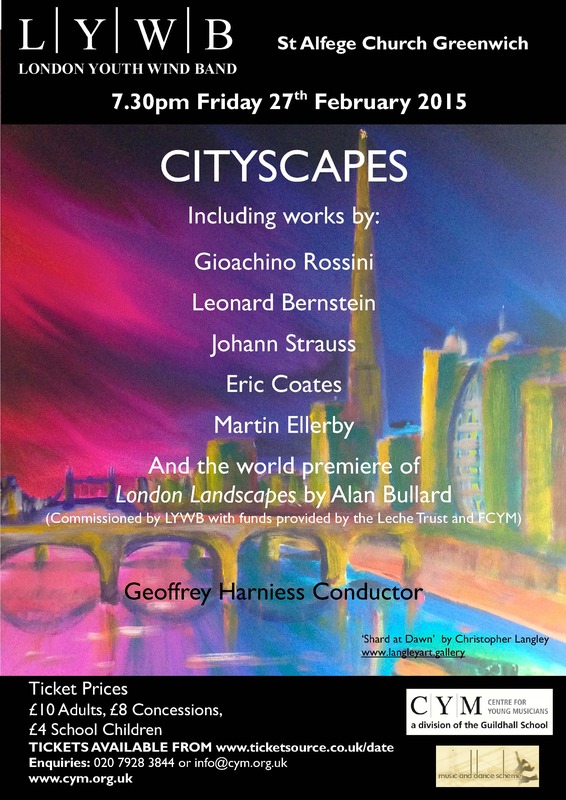 London Landscapes was commissioned with funding from the Leche Trust and the Friends of CYM, and the first performance is at 7.30 on Friday 27th February at St. Alfege Church, Greenwich, London SE10. This fine church has some history: it was rebuilt to designs by Hawksmoor in the 18th century, and substantially repaired after World War Two bombings, but the earlier building not only saw Henry 8th baptised, but also the burial of the sixteen-century composer Thomas Tallis. This entry was posted in Uncategorized and tagged Centre for Young Musicians, classical music, Leche Trust, London Youth Wind Band, St Alfege, wind band on February 11, 2015 by alanbullard.